While browsing the rugby internet today, we stumbled across an odd piece of news, one which troubled and shocked us. In an interview with Planet Rugby​ Dan Leo spoke out about how Pacific Islanders could lose a significant portion of their salary by electing to continue playing Test rugby. Daniel Leo spoke of the time he chose not to tour with the Pacific Islanders, instead signing a more lucrative deal with London Wasps. The issue at the centre of this is undoubtedly that of remuneration. In Ireland, we luckily don’t have a problem revolving around player availability. With the return of King Johnny to these shores following his stint in France, all our front-line internationals will once again be on centralised contracts and under the control and remit of the IRFU. This is the ideal scenario for us, especially with a World Cup on the horizon. The problem for smaller, second-tier nations such as Samoa, is that there is no money in the game at home. Therefore, the players from these island nations have to go abroad to ply their trade elsewhere. With the Unions of these smaller nations such as Fiji and Samoa unable to match the financial clout of the clubs in Super Rugby, the Top14 or the Premiership, the players involved are put between a rock and a hard place. WorldRugby (formerly the IRB) took the step of declaring international windows some years ago, as there is in football, to force clubs to release players for international matches. It now appears that clubs are finding ways to subvert these rules. Just last month, Census Johnston signed a new 2 year contract with Toulouse. He also announced that he was retiring from international rugby with immediate effect. 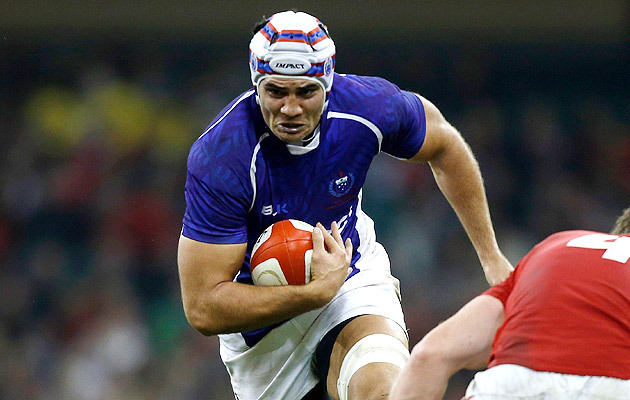 He told the Midi Olympique that it was “probably…the hardest decision of my career.” Six months out from a World Cup, the veteran Samoan tighthead elected to retire. He went on to say “I think it’s the best decision for my family as well.” Using our well-honed playschool skills, we joined the dots. While we can’t speak for Johnston, or his motives, on the surface it certainly appears as if there are other forces at play. From our viewpoint, he has taken financial security ahead of playing in a World Cup. Dan Leo reckons the same, although he holds nothing against Johnston for the decision he has made. What immediately struck us when we saw the path Census Johnston chose was the recent news regarding Gordon D’Arcy. The Leinster and Ireland stalwart has just recently announced that he will retire in October, at the culmination of the Rugby World Cup, assuming he makes the squad. We thought little of that news when it broke, seeing it as the norm for players to look to retire on the biggest stage of them all. This is not a luxury that Pacific Islanders can enjoy. The reality is much harsher. For players like Johnston, nearing the end of their careers, they need to make all the money they can while their bodies still allow it. Per ESPNScrum, the average contract in the Top14 in 2012/13 was €14,300 per month. Taking this figure as a rough estimate, players who decide to play in the World Cup and eschew the money stand to lose approximately €60,000 for the four months during which they are unavailable to their clubs. This figure is larger still when it is put in the context of what Pacific Islanders receive from their Unions for participating in the World Cup. According to Leo, the Samoans earn £400 a week for the duration of the tournament. That amounts to something around €2,150, were it to come to pass that they were knocked out in the group stages. Which would you pick? €60,000 or €2,150? The problem facing WorldRugby is what can they do to bridge that divide? It all boils back down to money. In an article written in May 2014, John Greene of the Irish Independent stated that “the fee for the 2023 tournament will be in excess of €100m, and possibly as high as €120m….while, on top of its fee, the IRB (now WorldRugby) retains all commercial revenue, including broadcasting rights.” That is one almighty amount of money, especially considering that the cost of all the expenditure, including infrastructure, must be borne by the host nation. On the surface, it appears that WorldRugby should be more than able to subsidise the smaller unions. From a financial point of view, they look more than capable of ensuring that players are not forced to choose between putting bread on the table and living out the dream of every rugby player on the planet. Could they move the World Cup outside of the domestic season, like it is in football? We would appreciate if you let us know what you believe to be the appropriate response. With the advent of professional rugby, it was only a matter of time before players started to become exploited. It is time for these practices to be eradicated. We aren’t saying every player should receive the contract he desires, that isn’t how life works. However, we are advocating that a player shouldn’t be punished financially for wanting to represent his nation on the biggest stage of them all. He should be rewarded, both financially, and in the fulfilment of his lifelong dream.